Baby monitors are used to monitor the baby's activities when the parents are not in close proximity of the baby. It can transmit audio as well as video. A baby monitor is also termed as a baby alarm. Audio monitor comprises a transmitter unit, with a microphone, placed near the child. It transmits the sounds by radio waves to a receiver unit with a speaker near the person caring for the infant. Video monitor is used to display images on the receiver, on a compact LCD screen or by plugging the receiver into a television. This type of surveillance camera is also known as baby cam.The global medical baby monitoring devices market is estimated to reach a value of US$1,577.2 Mn by 2026. Key factors driving the medical baby monitoring devices market includes rise in number of employed parents, increase in disposable income etc. Furthermore, increase in demand for smart baby monitors, and higher adoption of baby monitors in day care centers are some of the key factors fueling the growth of the medical baby monitoring devices market. Evolution in e-commerce has created huge opportunities for producers and suppliers in the industry. In order to cater to a comprehensive range of customers across the world, producers and suppliers of baby monitors are focusing on selling their products on various e-commerce websites. Online shopping has an upper edge over brick and mortar retail in a majority of industries. Increase in demand for baby monitors in emerging economies and rise in innovation and technological development is expected to trigger the growth of the medical baby monitoring devices market during the forecast period. However, a major challenge restricting the growth of the medical baby monitoring devices market is falling fertility rate. Security concern over information leakage through baby monitors is also anticipated to hamper the growth of the baby monitoring devices market. The medical baby monitoring devices market can be segmented based on product type, connectivity, hardware, application, and region. In terms of product type, video movement monitor is expected to expand at a faster rate in the near future at a CAGR of 6.2% (2018-26). Based on connectivity, the medical baby monitoring devices market has been divided into wireless and wired. Wireless baby monitors market is expected to expand at a CAGR of 6.0% (2018-26) due to increase in usage. Parents are increasingly using video monitors with wireless connectivity network. On the basis of hardware, the baby monitoring devices market has been divided into camera and sensors. Motion and sound detection cameras accounted for majority share and accounted for 40% of the camera segment in terms of value in 2017. Diaper attachment holds majority of share in the sensors segment followed by under the mattress segment. In terms of application, the market is bifurcated into residential, hospital, and nursery. Residential segment is projected to expand at a CAGR of 6.3% (2018-26) during the forecast period. Based on geography, Asia Pacific region is anticipated to witness the highest growth at a CAGR of 6.8% (2018-26) during the forecast period due to increase in number of working parents and rise in demand for video baby monitors in developing countries in China and India. Some of the prominent players operating in the global medical baby monitoring devices market includes Angelcare Monitors Inc., Dorel Industries Inc., Motorola Solutions Inc., Summer Infant Inc., Koninklijke Philips N.V., Snuza, Hisense, Windeln.De, and Sony Corporation. These players are estimated to face healthy competition in the near future due to presence of a large number of local players in the market. Major brands are likely to focus on research & development to strengthen their foothold in the global medical baby monitoring devices market. Companies are undertaking mergers and acquisitions, and joint ventures with local players to expand their product portfolio. Producers in developing countries are focusing on reducing their cost of production and increase profitability for the sustainable growth of their business. This report on the global medical baby monitoring devices market provides analysis for the period 2016–2026, wherein 2017 is the base year and 2018 to 2026 is the forecast period. Data for 2016 has been included as historical information. The report covers market dynamics, including drivers, restraints, opportunities, trends, and policy and regulations, which are expected to influence the growth of the medical baby monitoring devices market during the said period. The study provides a comprehensive analysis of market growth throughout the forecast period in terms of value and volume estimates (US$ Mn and Thousand Units) across different geographies. This report on the medical baby monitoring devices market is categorized on the basis of product type, connectivity, hardware, application, and region. Rise in number of employed parents, increase in disposable income etc. are seen as key drivers of the medical baby monitoring devices market across the globe. Increase in demand for baby monitors in emerging economies and new innovations and technological development is anticipated to create good opportunities in the medical baby monitoring devices market. Evolution in e-commerce has created huge opportunities for manufacturers and distributors in the industry. In order to cater to a wide range of customers across the world, manufacturers and distributors of baby monitors are focusing on selling their products on various e-commerce websites. Rise in popularity of smart baby monitors will trigger the growth of the medical baby monitoring devices market during the forecast period. 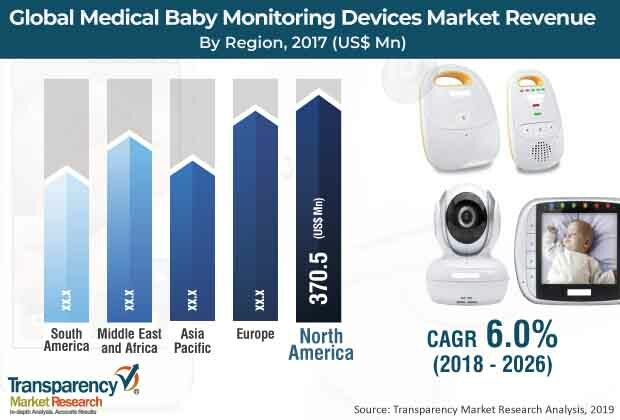 The medical baby monitoring devices market has been segmented on the basis of product type, connectivity, hardware, application, and region. Based on product type, the market has been classified into video monitor, audio monitor, and others. On the basis of connectivity, the market has been categorized into wireless and wired. In terms of hardware, the report is divided into camera, sensors, and others. Based on application, the report is bifurcated into hospital, residential, and nursery. Based on region, the report classifies the market into North America, Europe, Asia Pacific, Middle East & Africa, and South America. The regions are bifurcated in terms of value and volume. Furthermore, prominent countries covered in the report include the U.S, Germany, Canada, France, U.K., India, Japan, China, GCC, and Brazil. The report highlights key developments in the medical baby monitoring devices market. Porter’s Five Force Analysis, which identifies bargaining power of suppliers, bargaining power of buyers, threat from new entrants, threat from substitutes, and degree of competition is also included in the report. Value chain analysis shows work flow in the medical baby monitoring devices market and identifies types and raw material providers of this industry. Consumer buying behavior analysis and technological overview have been added in the report. It also covers region-wise price trend analysis. The comprehensive medical baby monitoring devices market estimates are the result of our in-depth secondary research, primary interviews, and in-house expert panel reviews. These market estimates have been analyzed by taking into account the impact of different political, social, economic, technological, and legal factors along with the current market dynamics affecting the medical baby monitoring devices market growth. The analysis has also been provided for each segment in terms of product type, connectivity, hardware, and application and region. The report includes competition landscape, which covers market share analysis of major players in the global medical baby monitoring devices market based on their evenues, and profiles of prominent players. The market share analysis benchmarks leading players on the basis of their capabilities and potential to grow. Factors including market position, offerings, and R&D focus are attributed to a company’s capabilities. Factors such as topline growth, market share, segment growth, infrastructure facilities, and future outlook are attributed to a company’s potential to grow. This section also identifies and includes various recent developments and strategy of leading players in the medical baby monitoring devices market. Company profiling includes company overview, major business strategies, and key developments. Companies profiled in the global medical baby monitoring devices market include Angelcare Monitors Inc., Dorel Industries Inc., Motorola Solutions Inc., Summer Infant Inc., Koninklijke Philips N.V., Snuza, Hisense, Windeln.De, and Sony Corporation.